Efrén Navarro (born May 14, 1986) is an American professional baseball first baseman and left fielder for the Hanshin Tigers of Nippon Professional Baseball (NPB). He previously played in MLB for the Los Angeles Angels of Anaheim, Detroit Tigers and Chicago Cubs. Navarro was born in Lynwood, California. He graduated from Lynwood High School in Lynwood, California. He played college baseball at University of Nevada, Las Vegas. Navarro was drafted by the Los Angeles Angels in the 50th round of the 2007 Major League Baseball draft. He was a 2011 recipient of the Rawlings Gold Glove Award with the Salt Lake Bees. 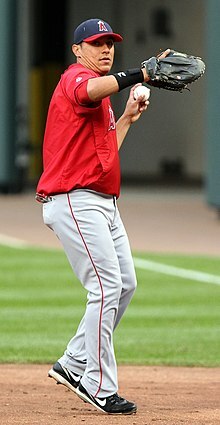 Navarro joined the Angels during September call-ups on September 1, 2011. Navarro spent the whole 2012 season in the minors. Navarro played in 64 games for the Angels in 2013, hitting .245 in 159 at bats. Navarro playing for the Salt Lake Bees in 2013. Against the Seattle Mariners on July 18, 2014, Navarro came in to pinch-hit for John McDonald in the bottom of the 16th inning. He ripped the first pitch through to centerfield, driving in the winning run represented by Mike Trout who was on second base after hitting his 100th career double. It was Navarro's first career walk-off RBI and the first pinch-hit walk-off by an Angel since September 7, 2012. It was just the second pinch-hit walk-off in the 16th inning or later in Angels franchise history. Efren hit his first career home run off Justin Verlander on July 26. Navarro was designated for assignment by the Angels on January 19, 2016. On January 26, 2016, Navarro was traded to the Baltimore Orioles for cash considerations. He was designated for assignment on February 25, 2016, and elected free agency rather than accept a minor league assignment. On March 2, 2016, Navarro signed a minor league deal with the Seattle Mariners. He was released on July 4. On July 5, 2016, Navarro signed with the Toros de Tijuana of the Mexican Baseball League. He was released on July 7, 2016. On July 9, 2016, Navarro signed a minor league deal with the St. Louis Cardinals. On January 10, 2017, Navarro signed a minor league contract with the Detroit Tigers that included an invitation to spring training. On September 1, 2017, the Tigers purchased the contract of Navarro and that same day was selected in the starting lineup. At the time of his call-up, Navarro was hitting .271 with ten home runs and 61 RBI for the triple-A Toledo Mud Hens. He was outrighted to AAA on November 3, 2017. He elected free agency on November 6, 2017. On January 28, 2018, Navarro signed a minor league deal with the Chicago Cubs. The Cubs promoted him to the major leagues on April 10 following Anthony Rizzo being placed on the DL. He was outrighted to AAA Iowa Cubs on May 29, 2018. He was placed on the temporarily inactive list on June 8 following his decision to play in Japan, and later released on June 14. On June 15, 2018, Navarro signed with the Hanshin Tigers of Nippon Professional Baseball (NPB). ^ a b DiGiovanna, Mike (January 19, 2016). "Angels sign Al Alburquerque; Efren Navarro is designated for assignment". Los Angeles Times. Retrieved March 6, 2016. ^ "Navarro Recipient of Rawlings Gold Glove Award". Minor League Baseball. Retrieved November 26, 2012. ^ Spencer, Lyle (September 1, 2011). "Angels add four as roster size expands". MLB.com. Retrieved September 1, 2011. ^ Ghiroli, Brittany (January 19, 2016). "Angels sign Al Alburquerque, designate Efren Navarro for assignment". MLB.com. Retrieved March 6, 2016. ^ "Orioles get OF Efren Navarro from Angels for cash". ESPN.com. Associated Press. January 26, 2016. Retrieved January 27, 2016. ^ a b Lewis, Adam (March 2, 2016). "Mariners sign 1B Efren Navarro to a minor-league deal". Seattle Post Intelligencer. Retrieved March 6, 2016. ^ Todd, Jeff (July 4, 2016). "Minor MLB Transactions: 7/4/16". mlbtraderumors.com. Retrieved July 4, 2016. ^ Beck, Jason (January 10, 2017). "Tigers sign Minors contracts with 22 players". MLB.com. Retrieved January 10, 2017. Wikimedia Commons has media related to Efren Navarro. This page was last edited on 18 November 2018, at 17:53 (UTC).